The OnePlus 7 may well be the most hotly anticipated high-end smartphone left to be released over the next few months. Or should we say three of the most hotly anticipated mobile devices expected out in the near future? That's right, it's looking increasingly likely that this small but fast-growing company will be revising its usual strategy this year, planning to unveil a family of three premium handsets soon rather than a single model following in the footsteps of the May 2018-released OnePlus 6. While it remains unclear exactly what will separate the rumored OnePlus 7 from the 7 Pro and 7 Pro 5G variants (apart from an obvious and major connectivity distinction), we might find out what the OnePlus 7 "series" is all about in less than a month. After recently "confirming" a vague and somewhat predictable May launch window, rising Twitter leaker Ishan Agarwal claims he has every reason to expect the OnePlus 7 series out around the world on the 14th of next month. Although that's certainly a specific projection, Agarwal doesn't make it clear if he's referring to a global announcement date or an actual commercial launch. The former sounds more likely to our ears, as OnePlus may not have all three versions of its next "flagship killer" ready for a commercial rollout at the same time. On the bright side, if history is any indication, it shouldn't take long for the company to widely release its non-5G phones after they are formally unveiled. Last year, for instance, the OnePlus 6 broke cover on May 16, going up for sale just six days later, while the year before that, the OnePlus 5 was announced on June 20 and released the very next week. If this pattern is maintained, the OnePlus 7 (and possibly, the OnePlus 7 Pro as well) are likely to go on sale no later than May 21, which is not too far away. Also based on the company's M.O., we can guess the OnePlus 7 lineup will be slightly pricier than its single model 6T predecessor, perhaps starting at $600 or $650 instead of $579. The OnePlus 7 Pro could cost a little more than the top-shelf $629 OnePlus 6T configuration, while the OnePlus 7 Pro 5G is rumored to end up around the $800 or $900 mark. That's not exactly what we'd call affordable, but it would still be cheaper than Samsung and LG's first 5G-enabled handsets. Then again, while we absolutely expect the "standard" OnePlus 7 model to be released on T-Mobile, US availability for the 5G variant feels like a fantasy. Last but not least, we need to point out the May 14 launch date is not actually officially confirmed. Like any rumor based on inside information, it could prove legit... or not. The OnePlus 6 was "the speed you need", the 6T aimed to "unlock the speed", and now the OnePlus 7 wants to "go beyond speed." Obviously, the new advertising slogan confirms the state-of-the-art Snapdragon 855 processor will be powering the next-gen flagship, but what about the "beyond" part? Based on all we know about the OnePlus 7, we're guessing that alludes to the phone's rather unique design compared to the likes of the Galaxy S10 family or LG's latest high-enders. Instead of sticking with a "conventional" notch or embracing a "modern" hole punch display to try to reduce bezels to a minimum, OnePlus will essentially achieve a true edge-to-edge design with the help of a pop-out selfie camera. That's not an altogether new approach in today's mobile industry, but it hasn't previously been attempted on such a "mainstream" high-end device in the Western Hemisphere. It remains to be seen if OnePlus can produce a robust and reliable construction with all the moving parts needed to make the front shooter pop out, which can certainly look cool but often prove a bit of a durability nightmare. 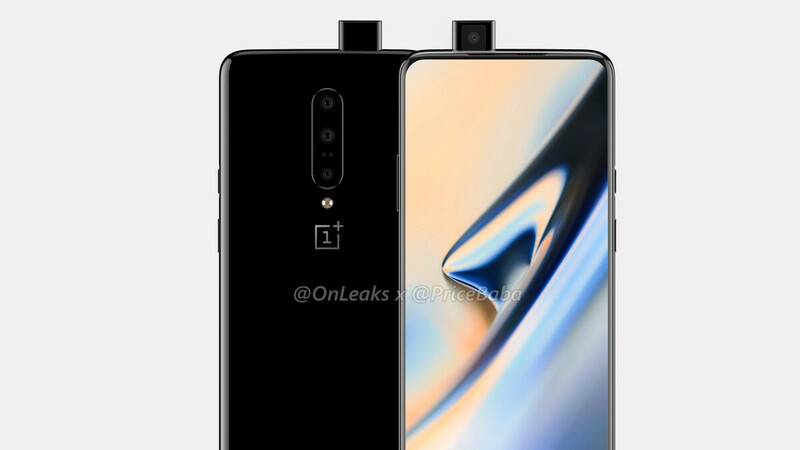 The OnePlus 7 is also tipped to take the imaging capabilities of its forerunners to the next level, reportedly sporting a triple rear-facing camera arrangement with impressive-sounding 48, 16, and 8MP sensors. Other widely speculated features include at least 8GB RAM (possibly, up to 12 on the 5G variant), an extra-large 6.5-inch screen size, a battery exceeding 4,000 mAh capacity, a vastly improved in-display fingerprint scanner, and alas, still no headphone jack or wireless charging support. This is not going to go down well honestly because 90% of the oneplus users I know use "Face Unlock" . Under display fps of Oneplus is quite pathetic . Even if they vastly improve the UD FPS regular users will miss the face unlock . Face unlock is not very secure. I can unlock my brothers OP7, and we do not look that much alike. I wouldn't trust it on my phone. Nice that you brother has the OP7 before the rest of the world. Your statement holds so much truth in it.